UPDATE: 12/07/11 6:30 AM - Just about exactly two weeks into the little phenomenon that is the Snowblower That Ate the Internet, I have cracked 500,000 views! 500,085 views to be exact, but who's counting? I don't mean to interrupt the news about catching a much larger break in the scheme of things that I posted last night, but SHAMWOW, this is awesome. I now return you to my regularly scheduled post. I've gotten a lot of interesting offers as a result of these snowblower shenanigans. I've been pitched pyramid schemes (why is that people who pitch pyramid schemes don't know that they sound like they're pitching pyramid schemes? ), and I've been asked to join weird online services, and I've been propositioned enough times that I no longer get embarrassed by it. I've also met some really interesting people, gotten some very neat opportunities to do something I've always wanted to (make a little coin from my writing - the tally for which is now up to $4.42, excluding a snowblower, but more on that next week). One of the most interesting people that reached out to me was Gene Fowler, the Creative Hotdog at Loogaroo. We've corresponded, we've chatted, we've exchanged some ideas, and today we've officially announced that we are developing a project together. For as long as I can remember, I've loved movies and TV. For as long as I've been able to write, I've scribbled down scripts that mostly never saw the light of day, but sometimes were performed in our garage (by Mike and I, or Rabbit and Oddfellow as we insisted were our stage names), and then even a few times at University (by the Acadia Theatre Company, where we spent more time in the basement of a building than computer science majors). Loogaroo is an animation and app development company based in Miramichi, NB, not far from my little home in Moncton. This is advantageous for me for several reasons. First, I've done more than my fair share of travelling and unless it's something near and dear to my heart, I feel no desire to get into another airport waiting lounge. Secondly, I like the fact that there's a company in my home province that's doing something like this and doing it successfully! But mostly, I think I like this Gene fella. He's got a good sense of humour, he has an excellent grasp of the creative process, and most importantly, he seems to like me. I'm not saying I need everyone to like me. I'm just saying I need everyone that I like to like me (like, y'know?). 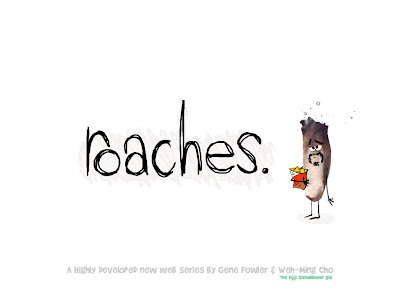 The project that we're working on is called Roaches. You know those short cartoons you see online? It turns out that somebody has to write those. And it also turns out that it takes some time and effort to write them. Therefore, if I appear to be distant or not paying attention to you, it's because I'm imagining how an anthropomorphic joint would handle the conversation you're attempting to engage me in. In other news, I would like the rest of the world to give my wife a great big hug and say "good job" for getting through her exam today. We had our first date night in a while, going out for supper and dropping by the now closing out Rogers store, where I picked up a copy of Kevin Smith's Red State on BluRay. Looking forward to watching that. Oh, and I think I may do an IAMA on Reddit sometime this week, maybe on Wednesday. Or Thursday. Possibly Friday. Let me know if that's something you'd be interested in seeing. If you aren't a Redditor (it's a lot like the Hotel California of websites) you realize that you can ask me questions whenever you like, right? Just send me an email or post a comment. Goodnight blognostifans. If you dream of something funny, make sure you write it down. Wow, that was a poignant thought to end on. Quick! Look at this! @Corey - You have a horrible user name, but I guess it keeps the spam out, eh? @Charlie - You know what? I do deserve it! I'm good enough, I'm smart enough, and doggone it, people like me.